Hotel MonacoHotel Monaco, located in the historic part of Philadelphia is probably one of the most popular locations where the brides love to get ready for their Big Day. It is just 3-4 minutes walking distance from some of the most famous Philadelphia wedding venues like Union Trust, Down Town Club, The Atrium at Curtis Center, Ballroom at the Ben and others. The hotel features absolutely gorgeous suites with dark navy curtains and beautifully patterned walls. Some of the suites have tons of light which is always a huge benefit for creating stunning photographs. Caroline spent the morning portion of her day in one of the Hotel Monaco's luxurious suites with her girls, where all of them were getting their make up and hair done, sharing some champagne and just enjoying each others company and simply 'taking it all in'. Once the bride got into her wedding gown, it was couple minutes left to do some close up portraits of just her alone. I placed Caroline right by the window in front of the dark curtain which served a perfect contrast background for her blond hair luminous skin. I also wanted to highlight the bridal veil, so the best idea was to have it wrapped around the bride's shoulders and just leave a little patch of light coming from the window to lit everything. 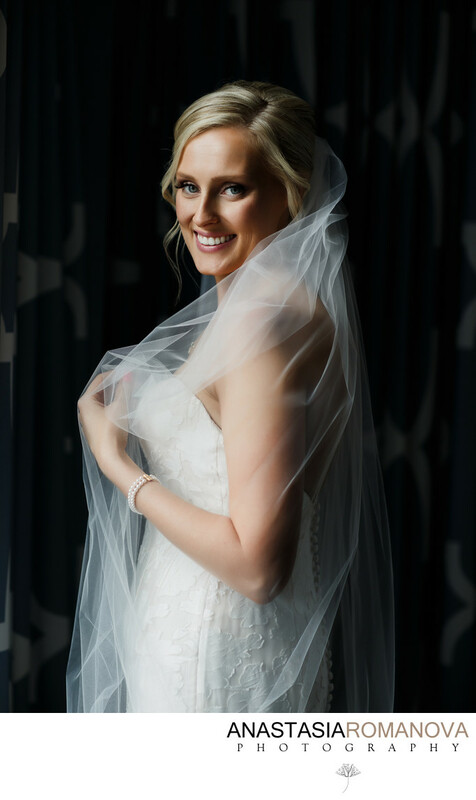 Caroline has one of a kind natural beauty and this portrait couldn't come out in a more perfect way when you have such a gorgeous bride to photograph.